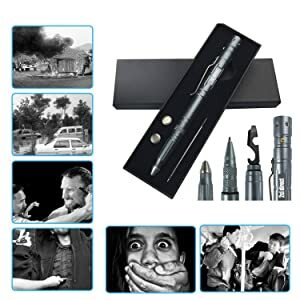 ★ Serious Self Defense Pen & Fast to Deploy - Low profile robust SWAT badass self defense pen made of ultra strong anti-rust aircraft aluminum. The only EDC kit you can carry to pass TSA security check .  Grasp the pen in one move out from your pocket. 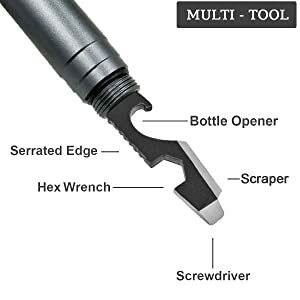 ★ Multipurpose Tactical Pen for Wide Application - Features Tungsten Carbide Tip Glass Breaker/ Nichia Tactical LED Flashlight/ Heaven Writing Ballpoint Pen/ Hex Wrench, Scraper, Bottle Opener, Screwdriver. 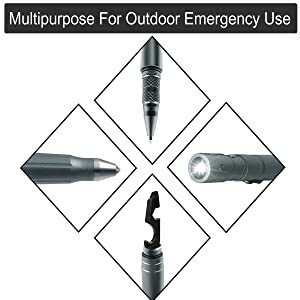 ★ Never Get Trapped In Danger – Tungsten steel (used in armor-piercing bullets) tip glass breaker smashes windows/Always Feel Safe in Life-Threatening Situations with this Easy to Conceal Self Defense Tool in Hand - stable thumb grip to apply maximum force. Keep this pen with you and feel safe, great for travelers, hikers, hunters, campers, etc. 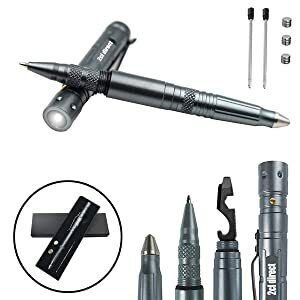 ★ Tactical Light & Refillable Heaven Writing Pen with BONUS - Tactical Nichia LED flashlight, very bright, durable and reliable, battery life is up to 200 hours. Amazing writing touch ballpoint pen for heavenly smooth writing, compatible with standard refills - FREE 3 sets of button cell batteries and 2 black ink cartridges, all securely packaged in a gift box. ★ Solves Other Brands Weakness - NO weak impact end, NO fragile push button mechanism, NO pen lost due to a loose cap, common ink cartridge EASY TO REFILL, NO ink leak. This tactical gear of yours comes with 2cl direct Ironclad lifetime satisfaction warranty, we’ll do whatever it takes to make sure you are happy with this item. I'm not planning on being threatened in emergency, but I'm planning to be ready all the time. This is why every smart citizen needs to carry an effective and useful everyday defense tool. This elegant pen is made for double-duty. Use it daily as an extra safety layer for emergency. Premium design and high quality material. Dark black. Smooth writing. Won't bleed through. Germany Imported smear-proof ink. Writes when wet. Ink quickly dries with a consistent ink flow. Note: Fisher space pen refill fits perfectly. The impact end of the pen can break glass, ceramic and metal. We used an extreme hardness super alloy called tungsten carbide. Bright enough to light up a room yet small enough to fit in your pocket. 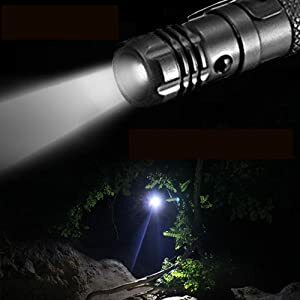 This tactical LED flashlight is imported from Japan, 50 times more expensive than ordinary flashlights, aims to be tactical and durable. NO pen lost due to a loose cap, no self-dissembling in your pocket due to a loose click mechanism in pocket, the pocket clip is remarkably useful. The serrated edge enables you to use the tool craftily comfortably. Made of Aircraft Aluminum, effect tactical action - a self defense protection when coming across emergent situations. - This Tactical Pen keeps you protected at all times. You can't put a price on having peace of mind when it comes to your safety and security! You can't put a price on having peace of mind when it comes to your safety and security! Serious Self Defense Pen & Fast to Deploy - Low profile robust SWAT badass self defense pen made of ultra strong anti-rust aircraft aluminum. The only EDC kit you can carry to pass TSA security check. A self defense protection when coming across emergent situations.This Tactical Pen keeps you protected at all times. Anti-rust aircraft aluminum Pen Body, built with the highest military & police-grade specs. - Precise & Smooth writing pen that endures extreme conditions ( battle field tested). Won't bleed through. Germany Imported smear-proof ink. Writes when wet. Ink quickly dries with a consistent ink flow. The 60 lumen tactical LED flashlight is bright enough to light up a room yet small enough to fit in your pocket. Japan imported tactical LED flashlight, 50 times more expensive than ordinary flashlights, aims to be tactical and durable. Comes with 3 sets of flashlight batteries, very easy to replace. - NO weak impact end. - NO fragile push button mechanism. - NO pen lost due to a loose cap. - Common ink cartridge EASY TO REFILL. With the pocket clip, it easily clips to your backpack, shirt or pant pocket. Comes with 3 sets of flashlight batteries and 2 black ballpoint pen refills for long term use, very easy to replace. All securely packaged in a 2cl direct gift box.